The tapas tradition has another Atlanta advocate at Bulla Gastrobar, from Coral Gables, Florida, but originating in Spain. About the restaurant & décor: Spanish tapas have become the darling cuisine in Atlanta. 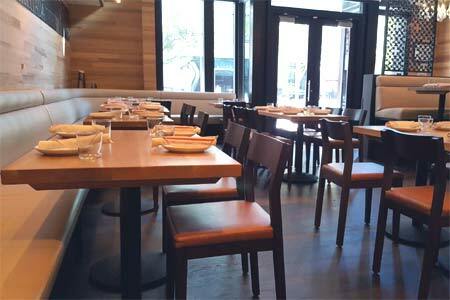 At Coral Gables-based Bulla Gastrobar, patrons glean a hint of what the tradition is like in its home country, while adding elements that one would not likely see there. Filling a contemporary, glass-surrounded space, Bulla Gastrobar has street-level outdoor seating and a roof-level private dining opportunity. Food & Drinks: Start with a dry sherry, as one would do in Spain; the rarely seen Maestro Sierra is a singularly rich example. The ham version of croquetas (croquettes) available as a tapa is very good, but the accompanying fig jelly is not complementary. Nor is the roasted garlic aïoli with the Spanish potato omelet, another dish whose authentic flavor seems impossible to re-create outside of Spain. Still, it’s tasty. Perhaps the most classic option is the pollo al chilindrón, originating in Aragón, although the chicken is supposed to be braised rather than grilled as done here. Nonetheless, it's quite close to the mark. Other choices include the jamón serrano and the bellota (acorn-fed ham), the Spanish cheeses and the churros for dessert. The wine list focuses on Spanish selections. While the restaurant offers two-hour validated parking, exceeding that limit could cost $30 in parking. If you plan to linger, take MARTA.